The Zooka ZS720 has been optimized for younger players and a few features have been changed to reduce cost. 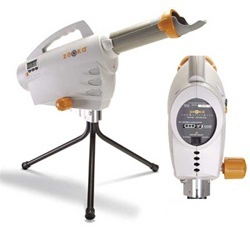 The Zooka ZS740 has greater speed and range for older players and can throw change-ups. The ZS720 is slightly smaller and comes standard with a shorter tripod. We recommend short tripods for younger players. The lower pitch release height is similar to an under-handed pitch and results in a flatter ball trajectory which is easier for young players to hit. A full panning tall tripod may be selected at the time of purchase if desired. It may also be ordered later as the kids grow up. The ZS720 can throw real baseballs, pitching machine balls, tennis balls and most safety balls at speeds up to 55 mph from distances as far as 65 feet. This Zooka ZS720 pitching machine throws fastballs only. The maximum throw distance of the ZS720 is 130 feet and the maximum pop-up height is 75 feet. The digital control panel of the ZS720 pitching machine allows you to easily control the speed setting of 10mph to 55 mph. It's light weight and simple design allows this Zooka pitching machine to be set-up or taken down in less than a minute without tools, and it's great for defensive fielding and pop fly practices. The rechargable battery for the Zooka ZS720 Baseball Pitching Machine allows 700+ pitches at 40 mph, 500+ pitches at 55 mph. A battery charger is included with a recharge time of 80% charged in 5 hours and totally charged overnight. The typical battery life is 5 to 10 years with normal use. The Zooka ZS720 pitching machine works by putting a baseball into the barrel of the pitching machine, the ball is detected and the compressor pumps up, and then shoots the internal cup propelling the ball. Depending on pitch speed and battery charge the ZS720 can pitch a baseball every 2 to 5 seconds. Its safety features include a password protected start-up and a one button shut down. The ZS720 comes standard with a short panning tripod which has a full 360 degree pan with a 26 inch pitch release height suitable for younger players. Available as an option is the tall panning tripod which has a full 360 degree pan and a 43 inch pitch release height suitable for older players. With it's 1 year warranty and affordable price, the Zooka ZS720 pitching machine is ideal for parents, coaches and machine pitch leagues. Throws real baseballs up to 55 mph. Also throws dimple balls, tennis balls, and most safety balls (baseball size wiffle balls and lite balls). Adjustable speed: 10 to 55 mph. Battery powered for true portability. Over 500 pitches per charge. Perfect for machine pitch leagues. Complete with internal battery, charger, and tripod. In only a few days of use, I can see instant improvement in my son's playing. This machine is so productive, I have decided to permit the children on the team to use it for practice. Amazing product! Just amazing! item came quickly. set up for kids youth baseball practice and loved it. Should get plenty of use out of it with 3 boys! The Zooka is a great pitching machine for our nine year old baseball team. Plenty of velocity and accuracy and lots of battery life. Cannot beat the rechargeable battery which eliminates the need for power outlets during practice. Sometimes a little variable in Seattle wet weather. Works best if baseball's are dry and clean. We briefly wipe them when using machine on sand infields, in wet weather, or turf fields with ground tire pebbles. Highly recommended.